Step out of the city life by going to The Great Ocean Road and St. Kilda Beach. 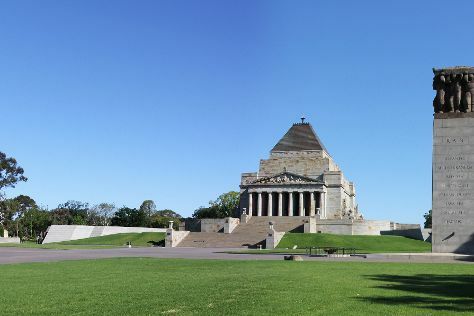 Popular historic sites such as Shrine of Remembrance and Old Melbourne Gaol are in your itinerary. There's much more to do: wander the streets of Melbourne Central, pause for some serene contemplation at Scots Church, get a taste of the local shopping with Degraves Street, and get interesting insight from Tours. For reviews, other places to visit, where to stay, and more tourist information, you can read our Melbourne day trip website . If you are flying in from Singapore, the closest major airport is Melbourne International Airport. In May in Melbourne, expect temperatures between 20°C during the day and 9°C at night. Finish your sightseeing early on the 14th (Tue) so you can travel to Cape Schanck. Cape Schanck Lighthouse has been added to your itinerary. Kick off your visit on the 15th (Wed): enjoy the sand and surf at Rye Beach, get close to the beloved marine mammals with a swim-with-the-dolphins experience, and then relax and rejuvenate at some of the top local wellness centers. To find reviews, where to stay, traveler tips, and more tourist information, read Cape Schanck tour website . You can drive from Melbourne to Cape Schanck in 1.5 hours. In May, daily temperatures in Cape Schanck can reach 20°C, while at night they dip to 10°C. Wrap up your sightseeing by early afternoon on the 16th (Thu) to allow time for travel back home.